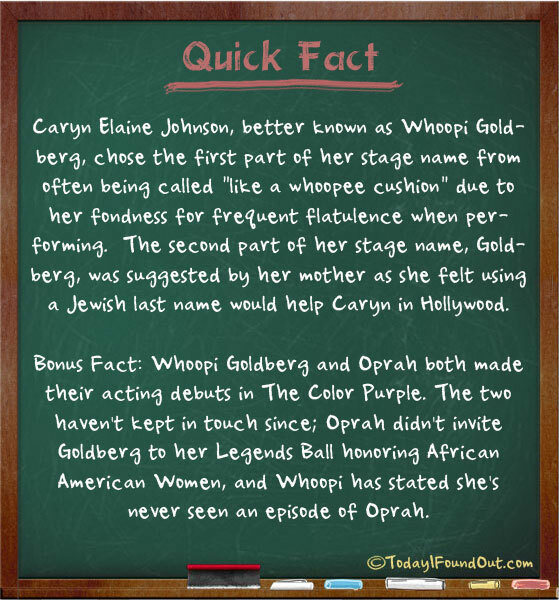 Caryn Elaine Johnson, better known as Whoopi Goldberg, chose the first part of her stage name from often being called “like a whoopee cushion” due to her fondness for frequent flatulence when performing. The second part of her stage name, Goldberg, was suggested by her mother as she felt using a Jewish last name would help Caryn in Hollywood. Bonus Fact: Whoopi Goldberg and Oprah both made their acting debuts in The Color Purple. The two haven’t kept in touch since; Oprah didn’t invite Goldberg to her Legends Ball honoring African American Women, and Whoopi has stated she’s never seen an episode of Oprah. Whoopi was on the Oprah Show twice in its final season.